WP7 major aim is the identification, analysis and quantification of socio-economic drivers of change. This information will be used to attribute observed changes directly to socioeconomic activities (i.e. land use), and – via exclusion – indirectly to other drivers of change such as climate change. 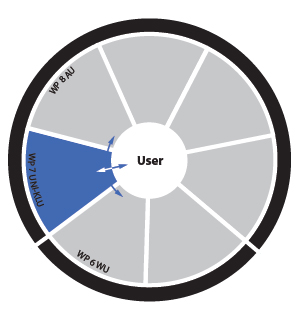 Thus, WP7 will provide an independent assessment of the usability of the EO products developed in BACI. WP7 will collate, aggregate and systematize data on inputs and outputs to and from the land system in order to provide a consistent link between system level changes and socioeconomic activities and drivers. A particular focus will be on NPP, which is an essential socioeconomic as well as ecological resource, and the spatio-temporal dynamics of its appropriation by human society. Furthermore, institutional analyses will be performed at national and regional levels in order to depict economic, social, political and institutional drivers of land change. A particular focus of research will be on the hotpots as well as coldspots of change, for instance in order to identify conditions hat determine the susceptibility of land systems to climatic or other environmental changes. WP7 aims also at identifying opportunities for using EO information to address challenging, currently under-research aspects of the global land systems, such as land-use intensity (change), subsistence land use, global grazing, forestry intensity, illegal logging. These issues pervasively relate to grand sustainability challenges such as e.g. land competition or food security, but are currently characterized by large knowledge gaps and uncertainties, at the regional up to the global level. This research focus will also aim at exploring the added value of the EO products for further scientific and policy relevant studies, e.g. advancing the understanding of the role of land use in the Earth System and Global Environmental Change. 1 Erb, K., Luyssaert, S., Meyfroidt, P., Pongratz, J., Don, A., Kloster, S., Kuemmerle, T., Fetzel, T., Fuchs, R., Herold, M., Haberl, H., Jones, C. D., Spiotta, E. M., McCallum, I., Robertson, E., Seufert, V., Fritz, S., Valade, A., Wiltshire, A., Dolman, A. J. (2017). Land management: data availability and process understanding for global change studies. Global Change Biology, 23(2), 512-533. doi:10.1111/gcb.13443. 2 Erb, K.-H., Fetzel, T., Plutzar, C., Kastner, T., Lauk, C., Mayer, A., Niedertscheider, M., Körner, C., Haberl, H. (2016). Biomass turnover time in terrestrial ecosystems halved by land use. Nature geoscience, 9, 674-678. doi:10.1038/ngeo2782. 3 Erb, K.-H., Kastner, T., Plutzar, C., Bais, A. L. S., Carvalhais, N., Fetzel, T., Gingrich, S., Haberl, H., Lauk, C., Niedertscheider, M., Pongratz, J., Thurner, M., Luyssaert, S. (2018). Unexpectedly large impact of forest management and grazing on global vegetation biomass. Nature, 553(7686), 73-76. doi:10.1038/nature25138. 4 Niedertscheider, M., Tasser, E., Patek, M., Ruedisser, J., Tappeiner, U., Erb, K.-H. (2017). Influence of land-use intensification on vegetation C-stocks in an alpine valley from 1865 to 2003. Ecosystems, 20(8), 1391-1406. doi:10.1007/s10021-017-0120-5. 5 Pongratz, J., Dolman, H., Don, A., Erb, K.-H., Fuchs, R., Herold, M., Jones, C., Luyssaert, S., Kuemmerle, T., Meyfroidt, P., Naudts, K. (2018). Models meet data: Challenges and opportunities in implementing land management in Earth system models. Global Change Biology, 24(4), 1470-1487. doi:10.1111/gcb.13988. 6 Reiche, J., Verhoeven, R., Verbesselt, J., Hamunyela, E., Wielaard, N., Herold, M. (2018). Characterizing tropical forest cover loss using dense sentinel-1 data and active fire alerts. Remote Sensing, 10(5): 777. doi:10.3390/rs10050777. 7 Reyers, B., Stafford-Smith, M., Erb, K.-H., Scholes, R. J., Selomane, O. (2017). Essential variables help to focus sustainable development goals monitoring. Current Opinion in Environmental Sustainability, 26-27, 97-105. doi:10.1016/j.cosust.2017.05.003.